There’s a reason we’ve included the word “hardwood” in our business name, King Hardwood Floors. And though we can and will install a variety of wood flooring products, we will always recommend traditional hardwood above all else. By our definition, a hardwood flooring product can be any number of wood species, such as white oak, red oak, maple, walnut, juniper, or hickory. Some wood flooring is also made of softer wood species such as pine or bamboo. Depending on the final finishing process, softwood can endure as well as hardwood. Lasts longer. No other manufactured wood or wood-type of flooring will last as long as a traditional hardwood floor. Hardwood can – in theory – last for a hundred years or longer. You will essentially never need to completely replace your floor again. When you’re ready to make your wood floors look new again, a sand and refinish is all you’ll need! Fully able to customize. The ability to craft a hardwood floor in a variety of ways is really only a limit of your imagination and your budget! Hardwood flooring can be cut and carved like anything else made from wood. Examples from our personal experience include scribe work around several boulders that were part of a custom mountain cabin, and adding a horseshoe made of contrasting wood inside an entryway. Hardwood flooring can generally be cut closer to barriers such as walls, fireplace mantels, stairs and other fixed objects inside a home. 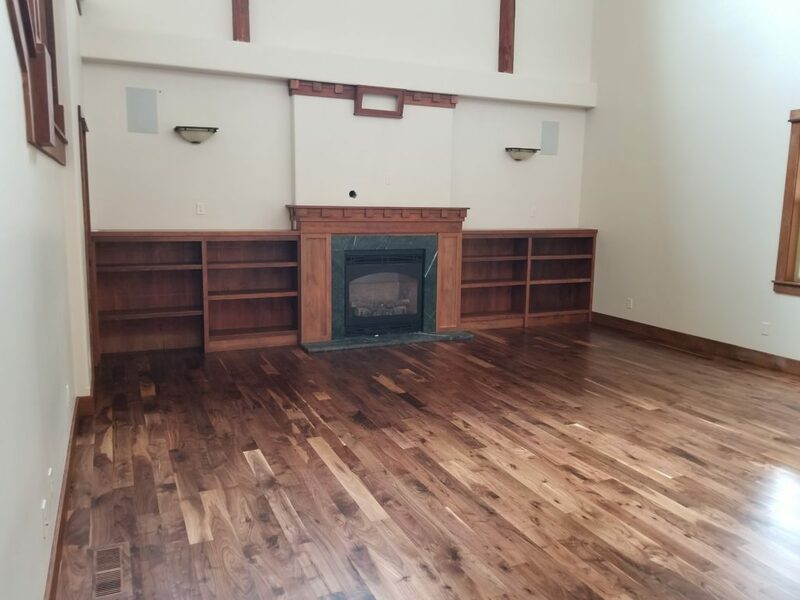 Other custom features are the ability to add-on to existing hardwood, change the color or stain with a refinish, add custom borders and feature strips, and more. Natural character and beauty. Like many other natural resources that humans try to mimic, it’s impossible to manufacture the nuances and unique features of natural wood flooring. From swirls in the grain, to rustic features such as knots and wormholes, each plank of hardwood is unique. Even clean, smooth wood flooring options contain subtle, yet beautiful differences that can complement even the most modern home design. Environmentally friendly and renewable. Though not all wood flooring is considered “green” our simplified reasoning is encompassed in #1 above. Regardless of the source, manufacturing method, or finish used — since it can be renewed and rarely needs to be replaced — our take is that a wood floor is “more” environmental than other flooring options. In addition, there are numerous ways to choose specific brands of flooring and finish products than can minimize the carbon footprint even further if you desire. Increases the value of your home. Your floor is the number one investment in your home. However, don’t let the initial cost of having an authentic and natural hardwood product installed in your home deter you if you can afford it. We’re often surprised when we see high-end homes that have laminate wood flooring in them, as than can affect the overall value in addition to looking “cheap”. Whether you intend to update your home to sell it soon, or plan on living on the floor for years to come, hardwood brings more than just monetary value to your home. Why do you love your hardwood floors? There are far more than only five advantages to choosing a natural wood floor. We’d love to hear yours in the comments section below. If you’re still exploring flooring choices, you might want to know — is there really a downside to having hardwood? Whether you’re comparing it to laminate flooring or not, we encourage you to consider the potential downside before making the decision. Prone to pet and furniture damage. Despite the option of sanding and refinishing damage, some may find the process not worth the time and expense. Pet claw marks, grooves from moving furniture, and high-heel marks will eventually occur if proper precautions are not practiced. If you want a short-term solution or are need of a scratch or a wear resistant floor — such as with a rental — then a natural hardwood product may not be the best choice. Dust and Chemical Sensitivities. Though dustless sanding and non-toxic finish products are customary, some people may still experience allergens or sensitivities. In most cases, this is temporary and will only last during the installation and finish curing process. However, if the affected household member is unable to be away from the home for the duration of the project, this may be a deterrent. But don’t cancel out the possibility of an engineered or prefinished hardwood product if you really want hardwood. If you’re still undecided as to whether hardwood is right for you, think about how the wear and tear of hardwood can preserve the record of life lived in your home — a record of memories. The floor of your home is where life happens and is not simply there to preserve a sense of lifeless “newness”. Consider the difference between the scuff marks left by a toddler who’d pranced across the floor in her grandmother’s high-heels versus the carpet stain left from her spilling her juice cup. One is a memory and the other is a mess! Like we said at the beginning, our name gives away our bias. And though our list of “cons” may be a little weak, we still wanted you to know some of the main reasons we’ve decided to provide hardwood flooring services above all other flooring options.